Apple has just released a beta edition of its Messages app, but not for iOS–this time it’s for your desktop. Apple’s iCloud system is grabbing existing IM chat channels, and will hit phone network SMS income as well. When Apple first released its Messages overhaul for the way iPhones handle test messages, and enabled it on iPads too, it was a sign that the company could see ways to innovate the pretty-much stagnant instant messaging market. It also let users of its iCloud service send short messages to each other without necessarily having to pay phone networks for the privilege. Now Apple’s said it’s expanding Messages to the OS X desktop, and that’s big news. 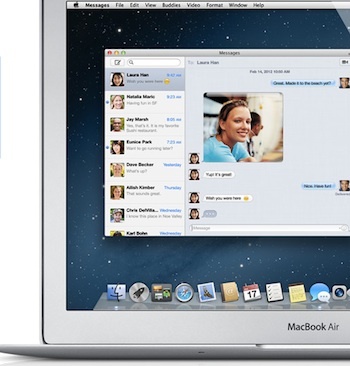 Download Messages Beta and get a taste of what’s coming in OS X Mountain Lion. When you install Messages, it replaces iChat. But iChat services will continue to work. And Messages brings iMessage to the Mac — just like on iPad, iPhone, and iPod touch running iOS 5. It notes you’ll be able to send “unlimited” (a key word) iMessages to any Mac, iPad, iPhone, or iPod Touch, and that you’ll be able to seamlessly start an iMessage conversation on one platform and carry it on on another. File transfers will also work, which is a partial slap at Dropbox’s business, and of course FaceTime is integrated into it. Because it’s also compatible with AIM, Yahoo!, Google Talk, and Jabber accounts it means Apple is aggregating much of the ways many users chat via IM into one location. That’s hugely convenient, and the seamless integration across devices could transform how you see instant messaging as useful. But more than that, it could be a significant blow to phone networks around the world which are pretty much universally complicit in charging over-inflated fees for SMS messages. iMessages to iCloud users can travel as pure data over the ether, you see, and thus avoid incurring users fees for sending texts. With 100 million iCloud users, a stat just revealed by Tim Cook this week, countless more due to sign up when the iPad 3 hits, and Macs bucking the trend by excelling in PC sales figures, this could be a significant move. Update: Ovum’s research for 2011 suggests that SMS’s days really may be numbered–inroads made by IMs and perhaps non-traditional SMS services like BBM and iMessage mean SMS revenues slipped by $13.9 billion dollars. Of course, SMS’s will linger for a while, not least because not everybody has a smartphone yet, and because of people who prefer to use the old-fashioned system. So they’ll still be minting billions for the phone networks.